THE Circle announces the Nature of the Great Work. The centre of this circle is the centre of the Tau of ten squares which is in the midst, as shown in the illustration. The Tau and the circle together make one form of the Rosy Cross, the uniting of subject and object which is the Great Work, and which is symbolized sometimes as this cross and circle, sometimes as the Lingam-Yoni, sometimes as the Ankh or Crux Ansata, sometimes by the Spire and Nave of a church or temple, and sometimes as a marriage feast, mystic marriage, spiritual marriage, “chymical nuptials,” and in a hundred other ways. Whatever the form chosen, it is the symbol of the Great Work. Crowley, A. (1913). Liber ABA Book Four Part II. hermetic.com. Retrieved 6 July 2010 from http://hermetic.com/crowley/book-4/aba2.html. The earliest crosses were simply marked as (T) or (X). Later variations added the additional arm to the top to form a (t or +). 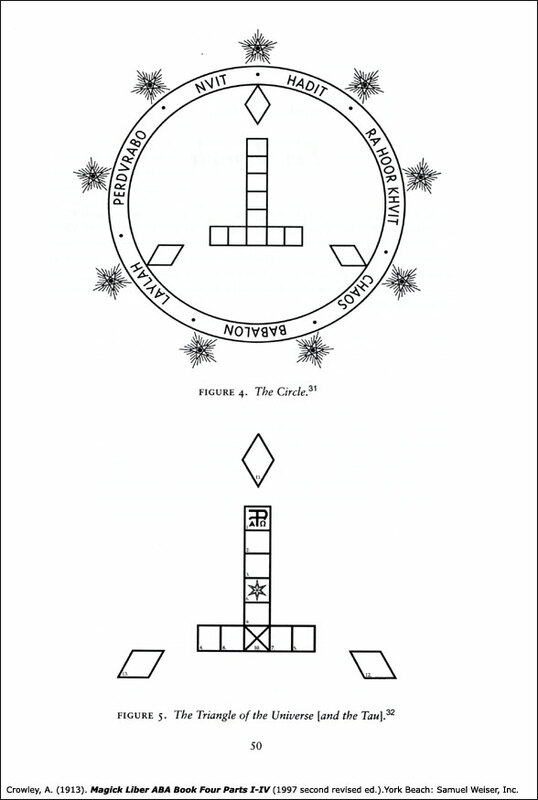 The equal armed cross (+) was used to represent the four cardinal directions, elements, colors of mankind (Hopi lore), as well as the Four Heavens of Zoroaster and its later variation in Jewish Qabbalah. When circled it became the four seasons, stages of life, and all of the associations of life, death, and re-birth. Quoting Jean Danielou’s Les Symboles Chretiens Primitifs (Paris, 1961), Cossey points out that the tau was used as a “Sign of the Elect” in the Old Testament, being traced on the heads of the initiates by the Angel of Yahweh. The ancient Egyptians, Gnostics, Eleusian Mysteries, and Rites of Dionysos, all had uses for the tau prior to its being written about in Revelations, or adopted as the Passion Sign of Christ.